People walk in a flooded Saint Mark Square in Venice, Italy. Torrential rains, gusting winds and landslides over the Italian peninsula have killed 11 people over two days. As the Associated Press reports, many of the dead were vehicle drivers or pedestrians who were struck by falling trees. Other casualties were caused by mudslides and high flood waters. Strong winds were as strong as 90 mph and in Rome alone knocked down more than 100 trees. 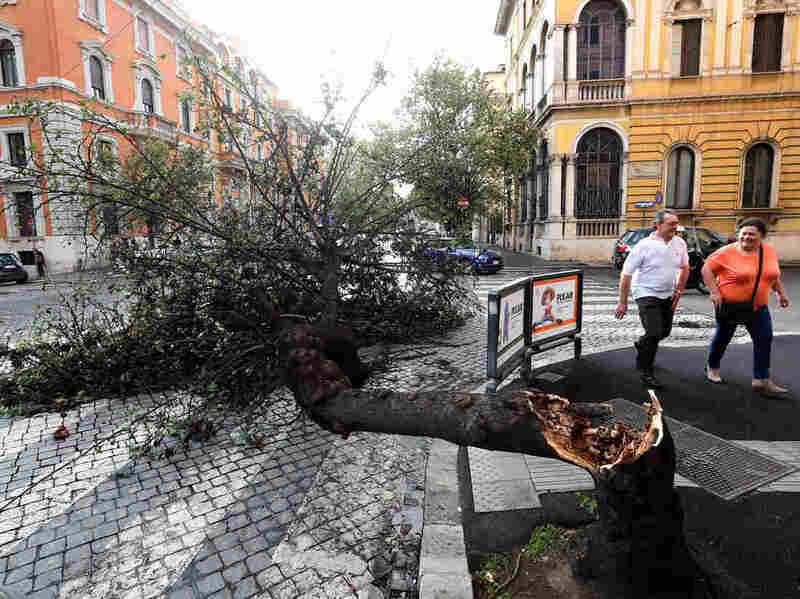 A felled tree taken down by strong winds is seen in downtown Rome. Venice saw an unusually high tide leaving three-quarters of the city covered in water. 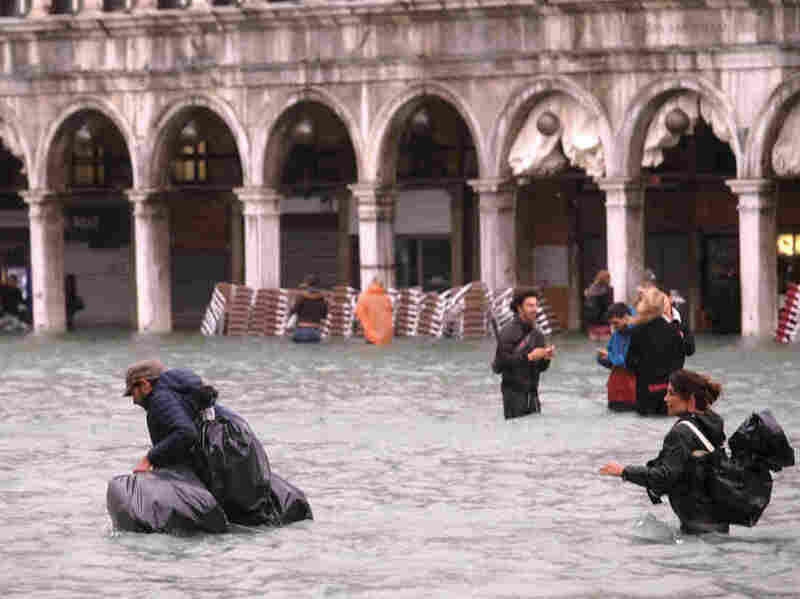 The famed St. Mark's Square was heavily flooded and tourists crossed the plaza in near waist-deep water. Reuters, quoting Italian media, said "it was the second time this century that [St. Mark's] basilica had been flooded, and just the fifth time it had seen such high water within the body of the cathedral in its 1,000-year history." "Italian News agency ANSA reported damage to the mosaic floors inside St. Mark's Basilica, where Monday's flood waters reached a peak of 90 centimeters (35 inches.) The bronze metal doors and columns also sustained damage in what was the fifth most serious flood in the church's 924-year history. "First Procurator Carlo Alberto Tesserin, who is charged with the basilica's preservation, told ANSA the church 'aged 20 years in one day.' He said that parts of the building, near the main entrance opposite the main altar, were under water for 16 hours." 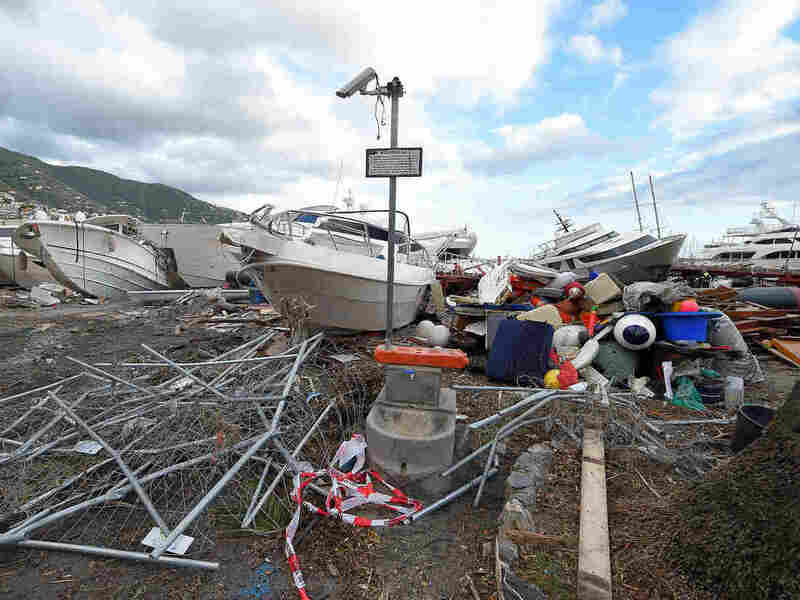 Destroyed yachts lie on the shore after windstorm and the strong sea storm in Rapallo, Italy. Officials advised residents to stay indoors as schools in large areas of the country remained closed Tuesday. The floods are forecast to subside through Wednesday.